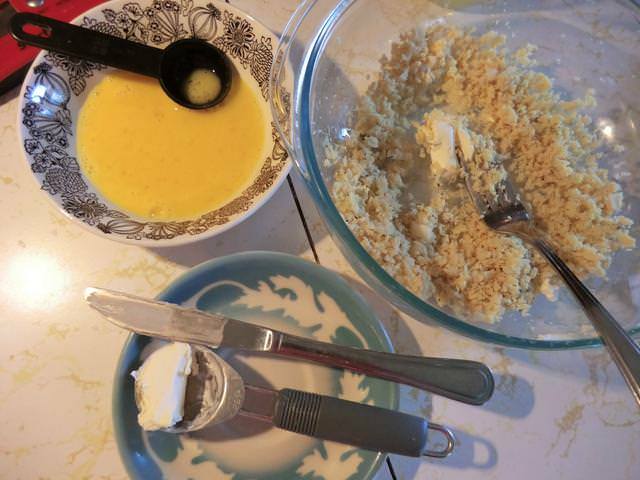 cauliflower | Cooking is Fun … Really!! 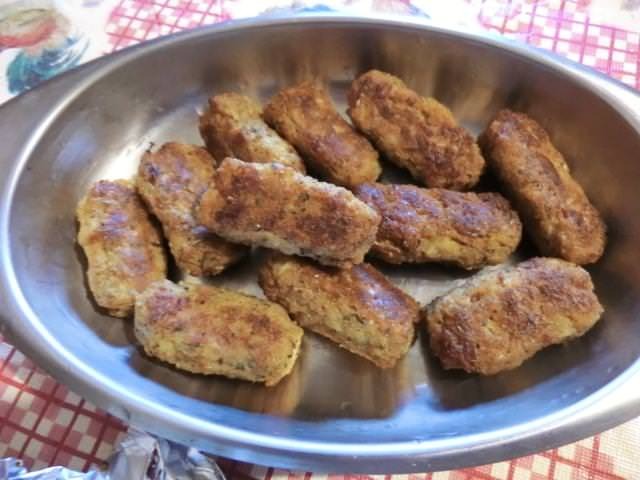 Tater tots, mini bites of grated and deep fried potatoes, are a convenience food that make a tasty and fast side dish. 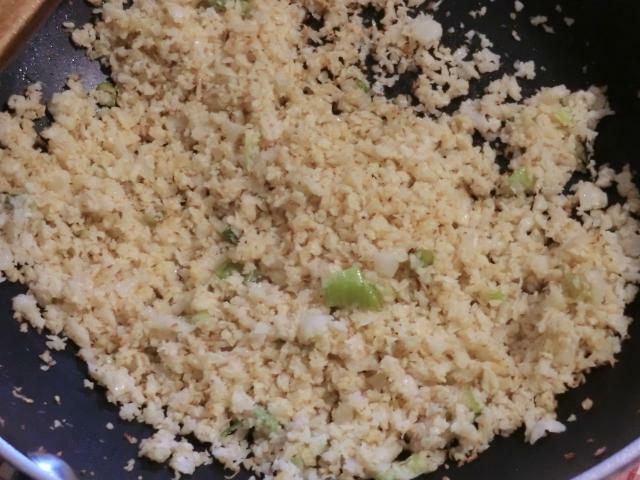 A healthier version may be made with “cauli-rice” … cauliflower florettes briefly pulsed in a food processor. 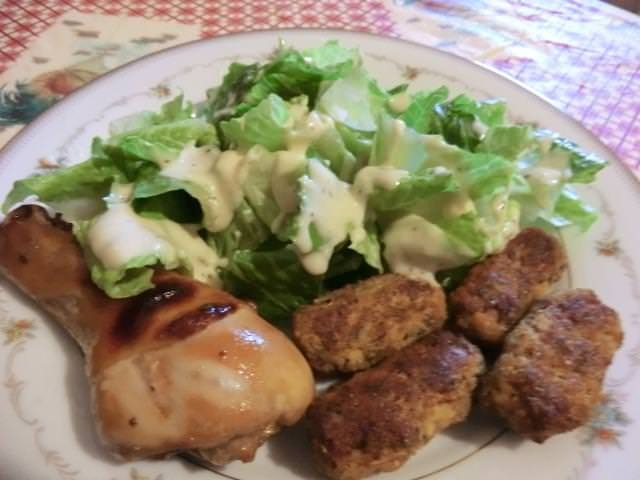 The recipe below is a simplified adaptation of the various techniques and ingredients found on line. Though I DID add a ‘variation’ that seemed more extravagant. I haven’t tried it yet. Mainly because I didn’t have either the bacon or the peppers on hand. However, I have two packages of raw cauli-rice in the freezer. Maybe I’ll make them for Christmas. Or New Years. *Break down a whole head of cauliflower into florettes. In a food processor, 1/4 of a head at a time, briefly pulse the florettes until they’ve broken down into roughly rice kernel sized. Spray a nonstick cookie sheet with cooking spray or brush lightly with vegetable oil. Set aside. In a medium sized bowl, combine all of the ingredients and season with salt and pepper to taste. 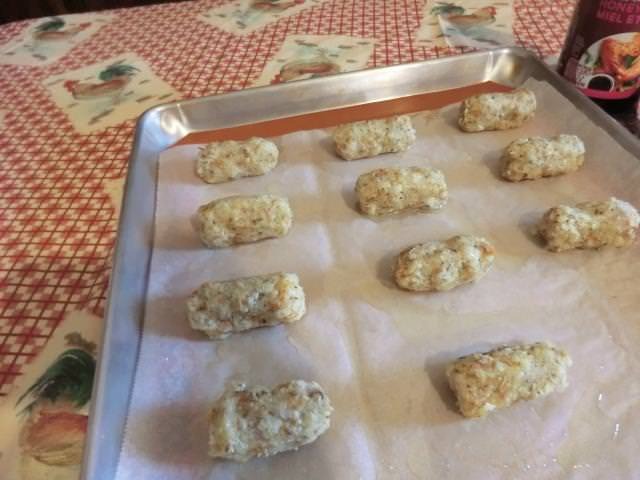 Spoon about 2 tbsp of the mixture in your hands and roll into small oval shaped tots. Place on the cookie sheet 1/2 inch apart and bake for about 20 minutes. Turn and bake for another 10-15 minutes. 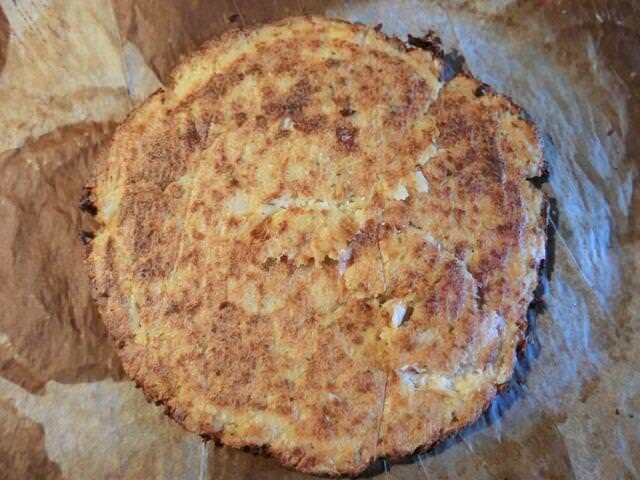 Both sides should be nicely browned and firm but still retain some bounce. Remove and serve as a side dish. Or, as an appetizer, serve with ketchup, pesto, hummus or your preferred dipping sauce. For an even more decadent appetizer, stir in the items below. 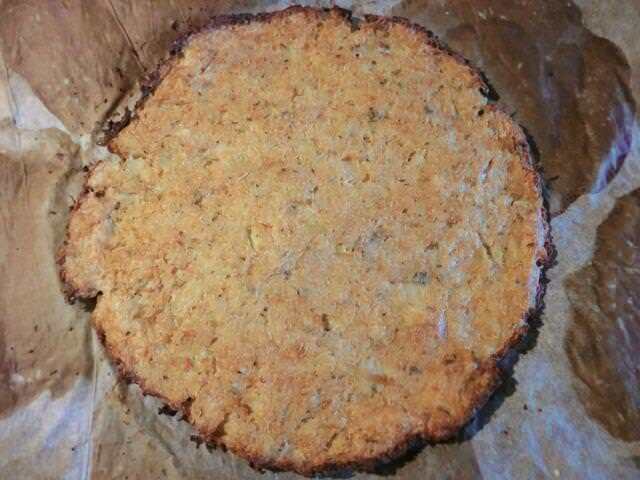 Because Karen, of “Back Road Journal”, posed an interesting question about getting a pizza crust, using cauliflower rice, that was firm enough to pick up … and because I was bored, I decided to attempt a technique and recipe found here. The recipe was scaled down to accommodate the reality that I only had 300 gm of cauliflower rice in the house. And it was frozen. 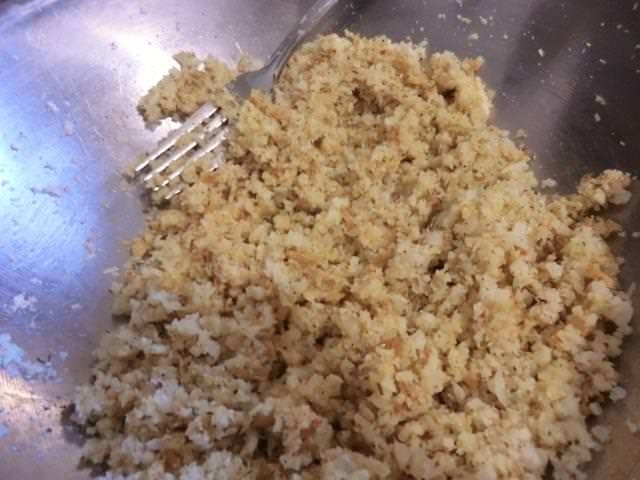 It’s possible that using fresh cauliflower, rather than frozen, may give you a drier cauliflower rice preparation to start with, and require less effort to get as much excess water out of your cooked cauliflower as possible. 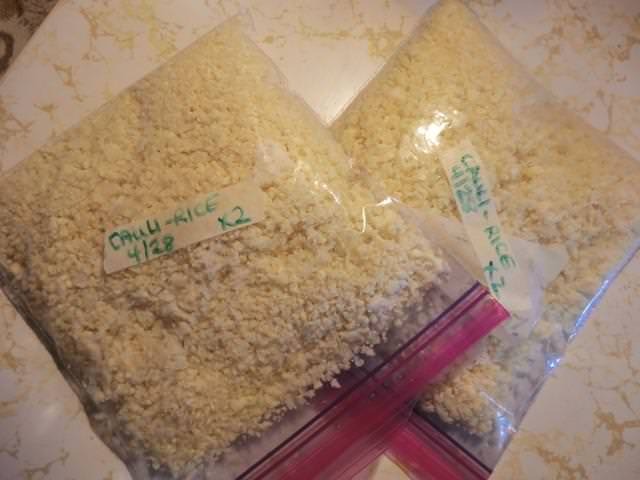 Instead of poaching/steaming the cauliflower, I used the microwave to cook the cauliflower rice directly from frozen. NOTE: One large egg has a volume of about 1/4 cups. Using 1/4 of an egg means that you use about 1 tbsp of well beaten egg. 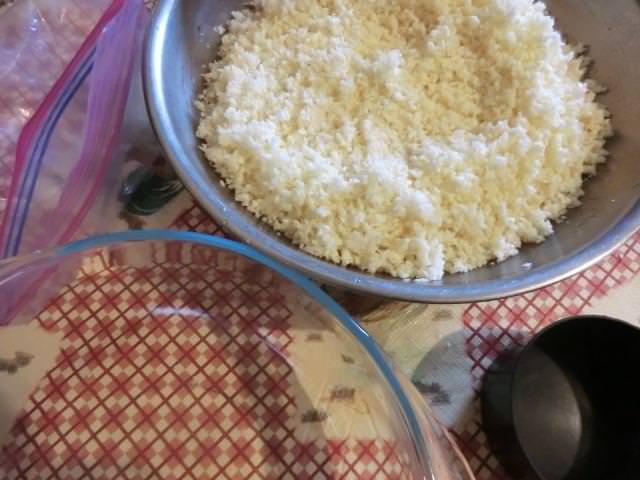 Place frozen cauli-rice in a microwave safe container with lid. Cook on high for 5 minutes. 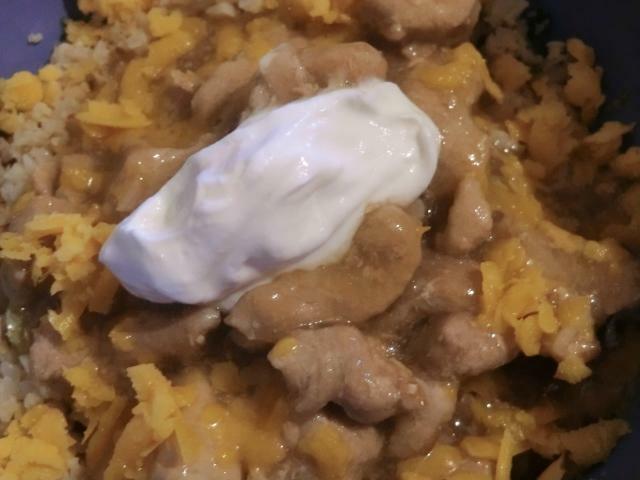 With a fork break up the cauli-rice, replace the lid, and return to the microwave and cook on high for another 2 minutes. Preheat oven to 400 deg Fahrenheit. 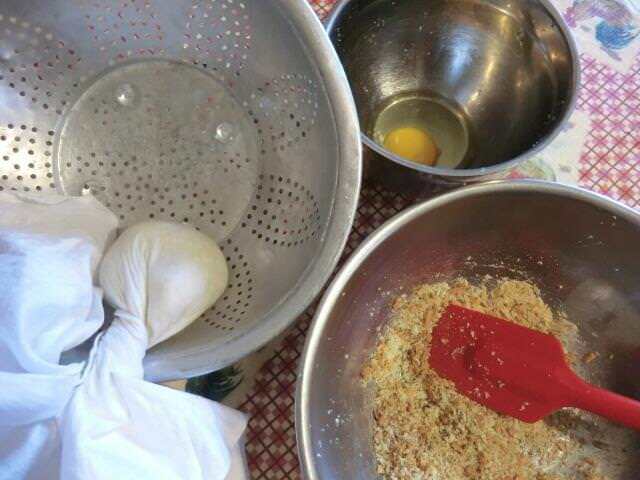 Cover a metal baking dish or sheet with a sheet of parchment paper. Let the cauli-rice cool for 5-10 min until it’s cool enough to handle. 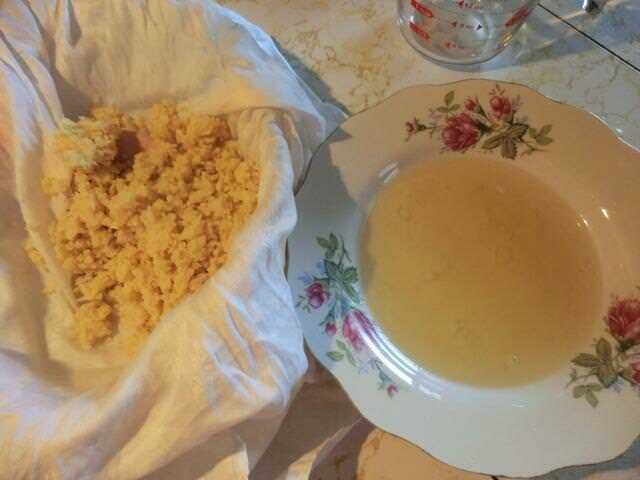 Transfer the cauli-rice to a sturdy linen towel and squeeze as much of the liquid as you can out of it. 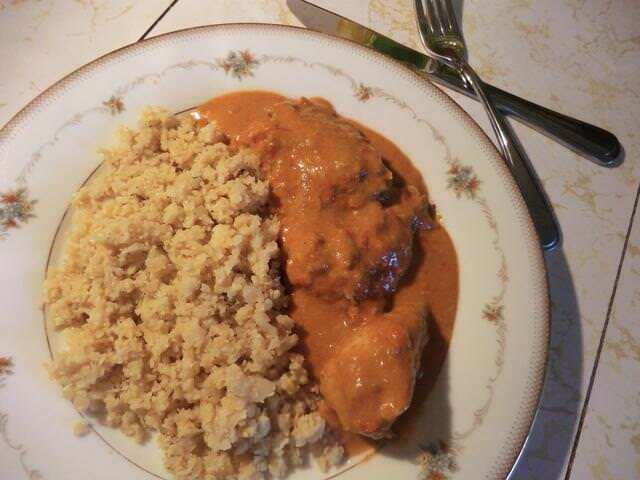 NOTE: I got about 160 ml (2/3 cup) of water out of the cauli-rice. Transfer the cooled cauli-rice to a bowl and add the remaining ingredients. Mix well. 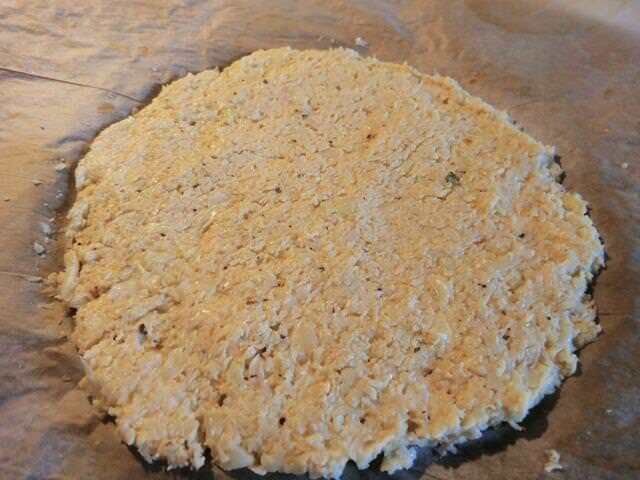 Transfer the cauli-rice ‘crust’ into the center of the parchment paper and pat out into a 16 1/2 cm (6 1/2 inch) diameter circle. It will be about 5 cm (1/3 inch) thick. Bake in the oven for 30-35 minutes until the top is golden brown. 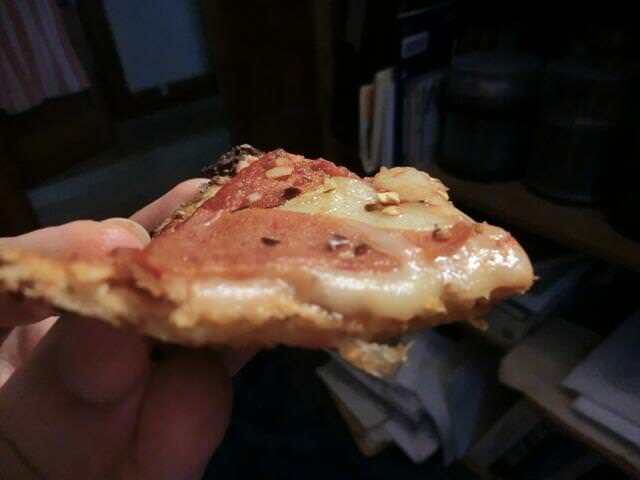 With a spatula, flip the ‘crust’ over, in case of sticky areas, and add the toppings. 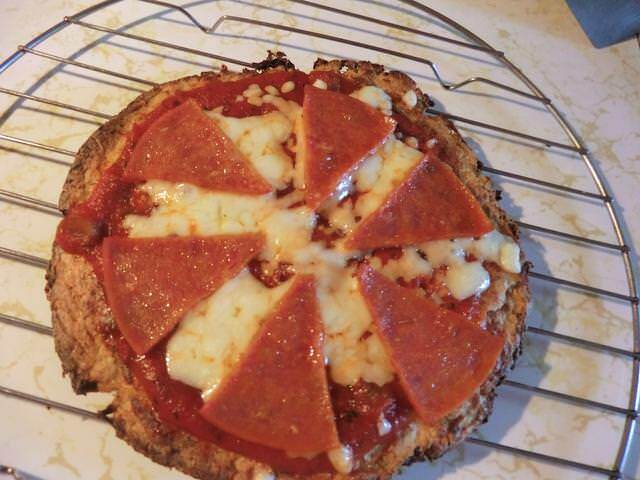 Return to the oven and bake 5-7 minutes until the cheese is melted and bubbly and the toppings are cooked. 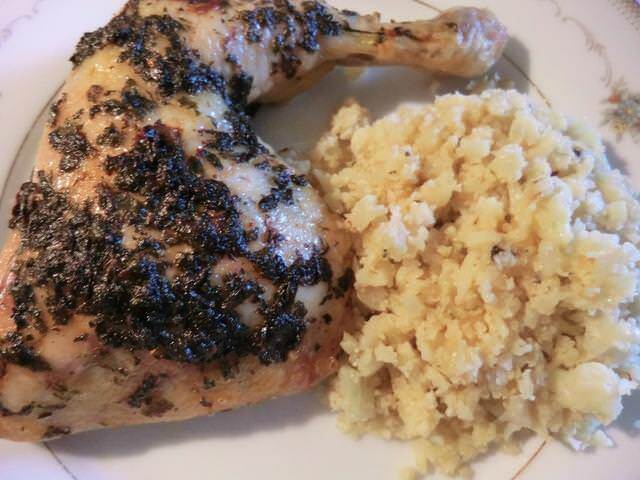 Reducing or avoiding carbohydrates in the diet is important for many people so, even though I enjoy mashed potatoes, rice, noodles or spaetzle/nokedli as a base for a dish of roast or paprika chicken, I decided to finally try ‘rice’ made out of cauliflower. 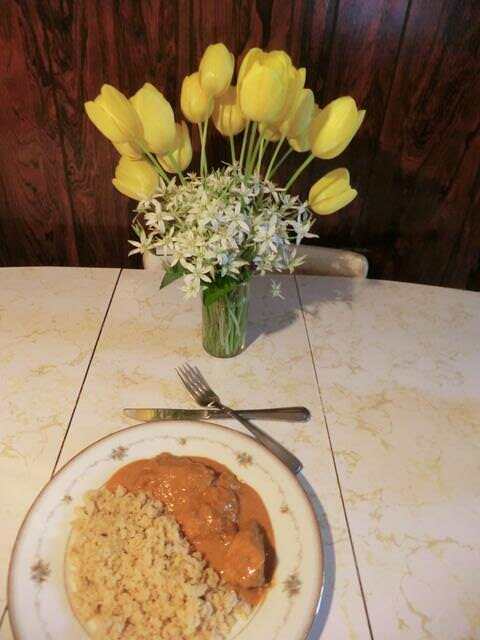 Since cauliflower is not one of my go-to vegetable options, I had some concerns. It turns out that the concerns weren’t warranted. 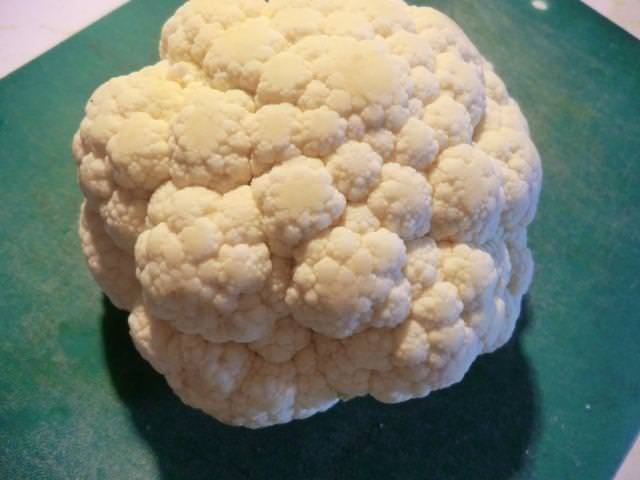 Buy the cauliflower when it’s on sale, prepare and freeze for a fast (<15 min) side dish from frozen. Cauliflower head with green leaves and stem trimmed off. Quarter the head of cauliflower and pulse each quarter until the florettes are broken down into coarse rice-sized and shaped pieces. Bag and freeze. No blanching necessary. Each bag held a bit over 300 gms … enough for 2 servings. In a large saute pan over medium-high heat, combine the oil or drippings with the sauteed onion. 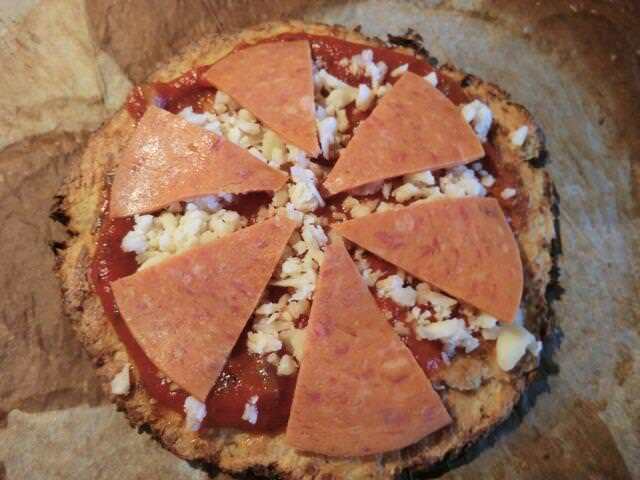 Add the frozen cauliflower rice and break it up as much as possible. Add a tablespoon or two of water and cover with a lid. Let steam for 5 minutes. Remove the lid, break up the cauliflower, sprinkle the salt and pepper over the top and combine the cauliflower with the oil/drippings. Cook for a few minutes until the ‘rice’ chunks are separate and have a bit of colour. Taste, adding more salt if needed and serve.